This kit enables construction of highly-active Platinum TALENs using two-step Golden Gate cloning method. Platinum TALENs have variable TALE repeats with one of two types of TALE scaffold: +136/+63 or +153/+47. The kit contains 35 plasmdids: 16 module plasmids with non-RVD variations, 11 intermediate arrays, and 8 destination vectors. 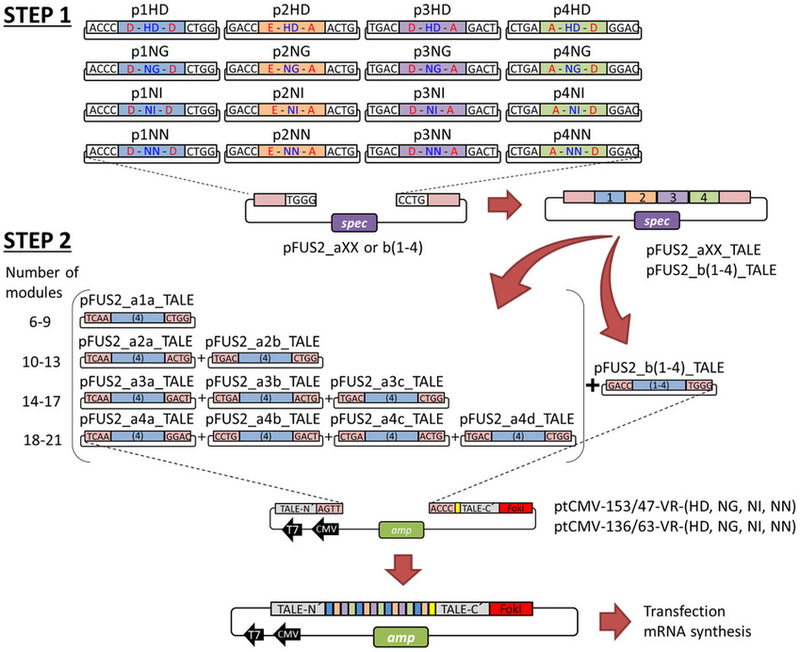 Repeating pattern of non-RVD variations in DNA-binding modules enhances TALEN activity. Sakuma T, Ochiai H, Kaneko T, Mashimo T, Tokumasu D, Sakane Y, Suzuki K, Miyamoto T, Sakamoto N, Matsuura S, Yamamoto T. Sci Rep 2013 Nov 29;3:3379. doi: 10.1038/srep03379. Pubmed PMID 24287550. The Platinum Gate TALEN kit enables construction of highly-active Platinum TALENs using two-step Golden Gate cloning method. Platinum TALENs have variable TALE repeats with one of two types of TALE scaffold: +136/+63 or +153/+47. The kit contains 16 module plasmids with non-RVD variations, 11 intermediate arrays, and 8 destination vectors. Download a PDF Protocol for TALEN construction using the Platinum Gate TALEN Kit as described in the original publication. "The TALEN kit used for constructing Platinum TALENs was a gift from Takashi Yamamoto (Addgene kit # 1000000043)"